Our model is based on four key elements that every business needs to get right if they are to create a sustainable and successful business. The model is designed to provide context, a common framework and a high-level view of their business. Although the model is designed to operate in a circular progression, the elements are all integrated. You can not change one element without affecting one or more of the other elements. If your organisation has a problem in one area, we will go back to the previous element to find the source of the problem. For example, if the strategy is not working the problem may stem from a poor culture. Peter Drucker says 'culture eat strategy for breakfast'. Many problems within a business stems from its culture. Many company's strategies add no value to a business because of a poor culture. Without a strong culture the strategy is just hope. Have you ever worked in an organisation where a new CEO or leader starts with hope and a new strategy. However, 12 months later nothing has changed. This can be due to a poor company culture. Strategy is all about growth. How you are going to grow your customers, customer value, your company and financial performance. To grow your business you need to position your business as the one the customer comes to over your competitors. A poor strategy executed well is disaster for the company. People - having the right people in the right job for the right price. Resources - having the correct resources to be able to execute the strategy. Systems - having the systems to work efficiently and effectively. Execution is the rubber on the road. One important part of execution is having measures and 'rules of thumb' that are aligned with the strategy. Without measuring it is easy to be caught up in being busy and productive. However, it may not be moving the business towards its strategic outcomes. A great strategy that is poorly executed is useless. 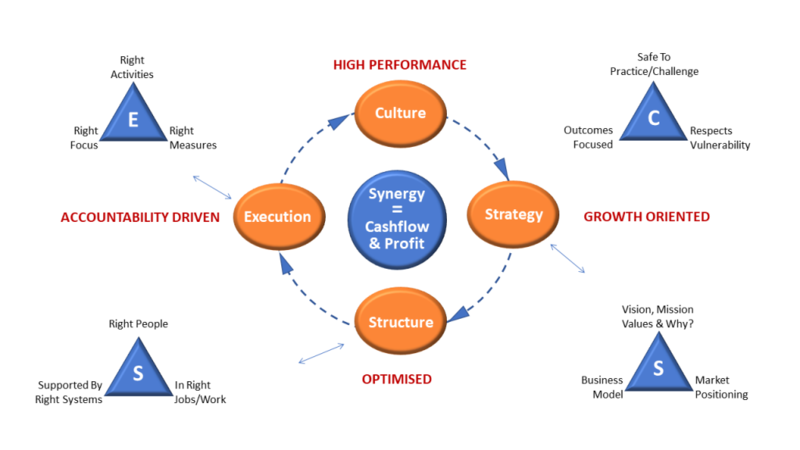 The ultimate outcome for implementing the S.E.C.S model is cash flow. Cash flow pays the bills, not solely having a profit. We have seen many businesses that make a profit every year but are going deeper in debt. This is a short explanation of the model we use for the four key elements that make up every business.